"That guy in the wheelchair has a couple of bucks worth of truck there," observed Richard Sparrow, a volunteer at the Texaco service station on Old Route 66 that has been repurposed as a visitors' center for Dwight, a village about 100 miles south of Chicago along Interstate 55. An intriguing-looking man in a toreador's hat and black ensemble was rolling away just after I showed up Friday, before I could strike up a conversation—a pity, there seemed a story there—and we were watching him drive off in a big GMC pickup. I had never heard that phrase before, and liked it for its internal rhyme—"a couple of bucks worth of truck" and we got to chatting. I asked his name, and he introduced himself, adding "the biggest sparrow you ever saw," a former printer who worked for R.R. Donnelly back in the days when the Chicago phone book came in three parts. We talked phone books awhile, and how his work had taken hims all over the globe. "I've been to China three times," he said. "I've been all over the world and this is the best country in the world." I did not argue, but enthusiastically agreed, particularly after I had the chance to nose around Dwight for a while. But first the iconic service station, whose classic design caught my attention like a star flare. Meticulously restored, with tires and fan belts hanging in the garage, an antique car to pose on, and a jar of Tootsie Pops, alongside a sign explaining that this was a tradition when the place was operational, and owner Phil Becker's dad, Red, liked to hand out sweets to the children of customers. "We invite you to enjoy a Tootsie Roll Pop in memory of Red Becker," said the last line of an explanatory sign, and I did, inspired by the generosity to select a red pop instead of my usual chocolate. I tucked it into my shirt pocket for future reference. Sparrow had been sitting with another older gentleman on chairs in one of the gas station's service bays, and from a distance I had at first thought they were manikins, a small town tableau. But they were very real. "So, what is there of interest in Dwight?" I asked, and Sparrow told me there is a Frank Lloyd Wright-designed bank a few blocks away. Good enough for me; I had no other task that day but to get home, and plenty of time to explore. He gave me clear directions that I of course mangled, driving a bit around the lovely town—wide porches, quiet streets, an Amtrak station I figured would get you to downtown Chicago in two hours. Hmmmm, I thought, imagining a call to the wife: "Sell the house honey, I found our new home..." Nah, not yet. The bank is a lovely Bedford limestone building. To be honest, I'm not sure if I'd give it more than an admiring glance at its clean lines, if I didn't know about the Wright connection. 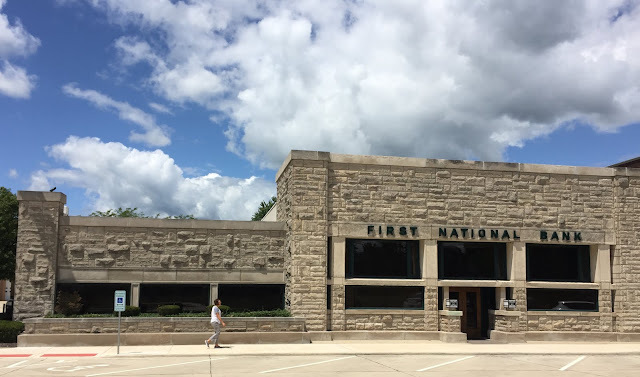 Originally the Frank L. Smith Bank, now the Dwight Banking Center: People's National Bank of Kewanee, it really is an amazing structure, and I'll tell you why. Take a look at the photo below? As yourself when it was built. Got a year in mind? Now continue reading below the picture. The bank was built in 1906. It's an astoundingly current structure—to me, it looks like something from the 1950s, when popular architecture began catching up with Wright. (Not that I consider that an improvement; I'm more of a corinthian column kind of guy. There's no accounting for taste). I went inside. The loveliest bank interior I have ever seen. "Do you mind if I take some pictures?" I asked teller Iris Cregar She came from behind the counter. "Let me turn some lights on for you," she said, illuminating a side room. "We have the original architectural drawings." "Do you get a lot of people coming in to see the building?" I noticed it was Free Popcorn Day, but didn't partake. I already had the lollipop from the Visitors' Center; I didn't come here to loot the place. People tend to be very nice downstate. They catch your eye and nod at you on the street. The staff at the little restaurant I had eaten in the night before in Lichfield, The Ariston Cafe, had been so friendly, it was almost unsettling. The maitre d' had actually touched my arm, guiding me to my table. The waiter, Logan, could only be described as buoyant. He conveyed a basket of bread to the table with the panache of a magician producing a bouquet. They brought a guest book for me to sign. I half expected the staff to burst into song. The food, by the way, was quite good, and the decor didn't seem much altered from when the place opened up in 1924. I was reluctant to leave. Yes, I know, the hidden flaws of small town America, better than most. I read my mail. But one downside of our culture is the need to fight every battle on every hill every time. I can't write that ice cream tastes good without one person mentioning fat content and another the oppression inflicted upon dairy cows, strapped into machines when they should be nuzzling their young with human-like affection. I do my share of dark cloud spotting too, sometimes. But not all the time. I liked Dwight, enjoyed poking around—the historic train station across from the bank, the fairly-active Main Street. I felt vaguely guilty, digging into mind for any kind of association with Dwight prior to showing up by accident—I stopped because it was noon and I was hungry, I didn't even notice where I was exiting, only that it had dining establishments—and all I came up with was the Dwight Correctional Center. An old frame of reference, since the women's jail closed in 2013. There's much more to the place than that. They have a festival, Dwight Harvest Days, coming up September 20 to 23, including a parade, a car and tractor show, Cutest Baby Contest, and the 21st Annual Basset Waddle, which now that I think of it I've heard of as well. Two hours from Chicago. It seems worth a visit. Where I ate lunch, by the way, the Old 66 Family Restaurant, is worth trying. Salads are a long shot downstate—you end up with a bowl of diced iceberg lettuce sprinkled with dry carrot shavings, with a few cherry tomatoes thrown in. I was considering the cheeseburger, always a safe bet. But I had a solid hour in the Holiday Inn's perfectly new, perfectly empty fitness center, and felt in a health groove. I had a good feeling about the summer fruit salad advertised on a card on the table, with grilled chicken and poppyseed dressing, and asked the waitress about it, and she rhapsodized the thing. "It took me a year to try it," she said, sharing my skepticism. "But when I did..." She made an expression of rapture. I inhaled the thing. Strawberries. Blueberries. Fresh romaine lettuce. Even the canned peaches seemed to somehow work. Or maybe I was just hungry. I almost told her, "You know, last month I ate at Alinea, the best restaurant in the world, and if they served me this, in a portion about an eighth the size, it would have fit right in." I formed the sentiment in mind to tell her. But that seemed pretentious, and perhaps not quite true, so I kept it to myself. But I tipped well and left content, hotfooting across the intersection to explore the Texaco station. After my sojourn in Dwight, pulling back onto 55 for the long slog home, I remember the Tootsie Pop, unwrapped it, and enjoyed a lingering bit of small town sweetness. 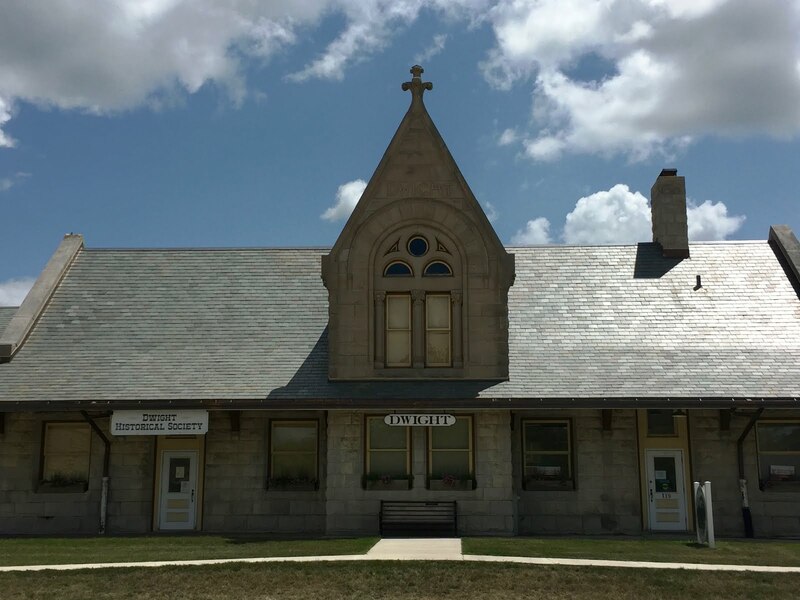 Nice story and similar to some small Iowa towns visited for fishing. Good point about the dairy batlle...some of that gets tiring. Marvelous. Reminds me of Travels with Charley, but better because of the spontaneity: the wonderful characters, the lovely buildings, the cultural events just popped up and were noticed, admired and passed on to us readers. Living not far from Dwight I am aware of some of it's history beyond the beautiful FL Wright building. In the early 1800's the Prince of Wales visited Dwight on what amounted to a safari. A huge prairie was outside of town and wealthy travelers would visit to experience the prairie, which at the time was an exotic phenomena to Europeans. He wrote of hunting on the prairie and seeing a prairie fire in the distance. More recent and perhaps of more interest to you is that the original Keely Institute was in Dwight and at it's peak was a huge complex of buildings where people came to take the cure for alcoholism. Dr Leslie Keely came up with what he called a foolproof, guaranteed cure for alcoholism - injecting patients with biochoride of gold. The Gold Cure. The institute operated from 1879 to 1965 and had 200 branches around the country at one point. People came to Dwight from all over the world and made Dr. Keely a very wealthy man. The structure of the cure involved a configuration not unlike a pyramid scheme. Have you noticed people's tendency to believe confident know it alls? The last time I was in Dwight was almost 20 years ago, when my wife and I were cruising down Route 66, in a 1963 Buick LeSabre that I used to own, on our way to Normal to visit a friend. We were trying to tear through the fabric of time, and experience a bit of the past. Towns like Dwight almost made that possible. Diana Oughton (1942-1970) was born and raised in Dwight, and her prominent family was also connected to the founding of the Keeley Institute. She and two other members of the infamous Weather Underground were blown to bits in an explosion in a Greenwich Village townhouse, which was being used as a bomb factory, and which was also next-door to the home of actor Dustin Hoffman. 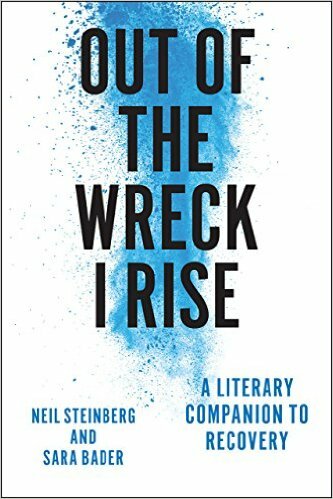 Three things struck a cord with me. The nodding, the smiling. Im from a small town. This was what we did. Imagine my shock when I arrived in Chicago, nodded and smiled, said good mmorning to a fellow window shopped only to recieve a questioning, suspicious look followed by a hasty retreat. The general friendliness friendlines. The corner gas station owner once insisted on driving me to the emergency room. I was sixteen,parents out of town, driving myself. I wasnt upset, my stomach really hurt butbbeing military, the emergency room was equivelent to a doctors office visit. He wouldn't have it, drive me in my car, walked me in, then disappeared. Third, The Basset Waddle. Actually, the whole parade with Basset Waddle as a highlight. Now, there is a story as delightful as the Japan mascots stories. If you do go,please take pictures! To be honest, I'm not sure if I'd give it more than an admiring glance at its clean lines, if I didn't know about the Wright connection. And that, right there, is why I dislike Wright's architecture. Sorry to spot dark clouds, but I have never understood why anyone thinks his boxy obviousness, rendered into unlivably low ceilings with leaky roofs, is in any way noteworthy. When there is an Academy of the Overrated, it will have a Wright-like design. The magazine I worked for ran a few stories on Wright's architecture in Ohio, so I was all over several of his houses, inside and out. The leaky roofs were not caused by poor drainage, but by a total lack of drainage, which turned them into retention ponds. Why was there a total lack of roof drainage? Because Wright did not want to compromise the appearance of his houses by adding gutters to them. Unbelievable? Yeah...but true. Wright didn't give a damn about whether or not his structures functioned well, or even if they functioned at all. Nor did he care about the comfort and well-being of the occupants. It was all about style over substance. Obviously, Wright was far ahead of his time. I took Route 66 back to San Diego in late 71. In a big hurry after maximizing my leave, I missed most of the details. Had car trouble about 30 miles west of Needles, CA and got a lift to a junkyard in Essex, a little further west. Don't remember anything about the clerk who directed me to the pay phone but I've never forgotten the phone. It had a coin slot but no dial. To get an operator you cranked its' number, 2 longs, 4 shorts. Don't know if it was the last crank phone in America but 20 some years later on CBS Sunday Morning they ran a piece about the last city in America to receive broadcast television, Essex California. didn't doubt for a minute. Next time you're in Dwight, stop at the library. It has views of the historic windmill, which is also quite beautiful. The library was the stable for the late 1800's Mansion that later became the Keeley institute. The original owner of the Mansion and stable had a $6,000 dog and the stable included an inside run for the horses in the winter. The building was most recently a restaurant, the Country Mansion, which closed in March and was just put on the market last week. Hoping it becomes a restaurant again - very charming building and a lovely lunch break on the way to Champaign. Worth waiting for. Thanks for the story and for the heads up that ig would be late. Stopped me from making a fool out of myself and pointing out that my unearned daily free gift is missing at 2 AM. It was done specifically for you, Paul. Sometimes your reminder is ... ah ... unwelcome. I'm dancing as fast as I can, and the days when I just plumb forgot to post the thing are pretty much behind me. I will definitely remember not to be impatient with the gift. No apology necessary. Trust me, I felt slightly dickish even mentioning it. But as night gathered, I was thinking, ruefully, "Paul Fedrick will be tapping his watch face at 2 a.m." It's like when your wife points out some traffic hazard while you're driving: annoying except when useful. Then it's appreciated.